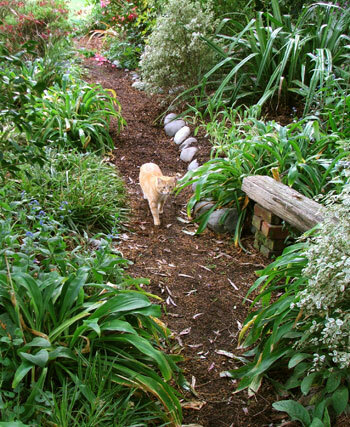 The Wattle Woods are full of exciting garden paths. 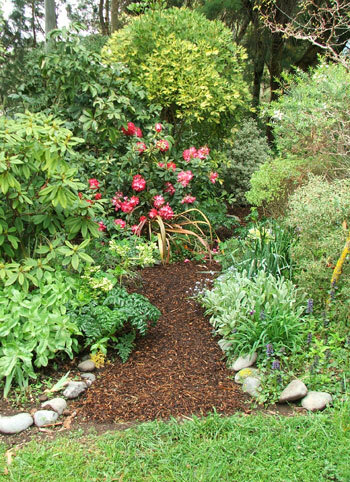 The main path, covered with soft bark mulch and edged by river stones, wanders right through the middle of this woody garden. It's wide and wheelbarrow friendly, too! 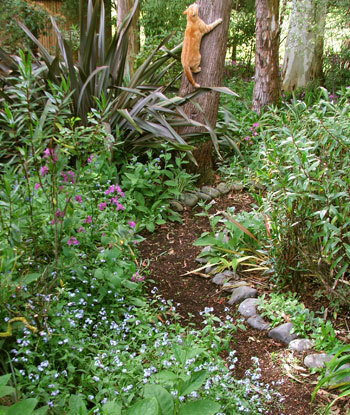 Smaller paths push through greenery on either side, though these path routes are forever changing - sometimes as a result of over-enthusiastic planting. Blame the Head Gardener and her lack of sense of scale. The addition of a little wriggling stream, with two curved footbridges, has brought some stability to the network of side paths. The lower main path starts down by the Pump House and winds gently up the slope to dog-leg around a wooden seat. The upper path then continues on to Rooster Bridge and the water race. It passes native Pittosporums, Hebes and Phormiums, with smaller foliage edging plants like dwarf Agapanthus and Rock Lilies. Earlier mass plantings of Japanese Irises have been largely ripped out now. They were far too scruffy for long periods in the year, and would always end up lying flat on the ground. Wattle and Eucalpytus trees, some with trunks leaning over at ridiculous angles, dominate the whole area. When the wind is blowing the Wattle Woods paths need to be walked with caution. Wattle wood is very brittle and branches big and small can easily snap and fall. Two paths lead off the main path towards the fence-line, passing through mass plantings of rugged species Agapanthus. Tough ornamental grasses, species Phormiums, Astelias and rock lilies (Renga Renga) add their green spikiness to the greenery, all growing without complaint underneath the towering trees. Honesty, both purple and white flowering, self-seeds everywhere and looks just magical in spring. Half way to the water race is a junction, where a smaller side path wiggles off to the glass-house and two others, straighter and more sensible, lead to the grass of the Pond Paddock. The main path continues past an inviting seat (surrounded by Renga Renga) and on to Rooster Bridge, past my rather beautiful (in spring, anyway) Camellia and Hellebore garden. The gardens on the sunny side of the main path contain a variety of ornamental shrubs - Rhododendrons, Choisyas, Camellias, and shrub roses (mainly rugosas and hybrid musks. This is still a tricky area in which to garden, though, with the Wattle tree branches reaching out overhead. At the moment the rugosa roses have spread up and out, claiming all the air space, and it's impossible to find a way through. So I've blocked off the middle section of the path. I don't want any accidents! Another little path curves underneath the old apple tree, connecting the glass-house to the Pond Paddock. It wiggles past two favourite shrubs (Cotinus and Miscanthus zebrinus), ducks by the large shrub rose Complicata, and emerges alongside a huge Cream Delight Phormium. At some times of the year this path is far too thorny to navigate safely, while heavy branches laden with apples hang down overhead. Perennial Toad lilies and sedums flop all over it in autumn. But then everything gets trimmed and all is well again! The Wattle Woods paths traverse one of the driest areas in my garden, much of which is sadly not reached by the main irrigation system. So the plants need a lot of extra watering, and there are always hoses lying on the paths to trip up visitors. Every summer I make huge resolutions to apply some tough gardening-love and leave things to fate. I always back down, and by mid-summer I am shifting the hoses every hour.